A mountain lion was caught in an aqueduct in Santa Cruz on May 16, 2013. A mountain lion trapped in a steep concrete culvert in Northern California was tranquilized and authorities planned to put the animal back in its habitat. The big cat was first seen about 4 a.m. Thursday near Water Street and May Avenue in Santa Cruz (map). Santa Cruz police Deputy Chief Steve Clark said a member of the Puma Project at the University of California, Santa Cruz, successfully drugged the untagged adolescent cat shortly after noon Thursday and planned to place it back in its habitat. The county Sheriff’s Department, Santa Cruz police, California Department of Fish and Wildlife, and animal groups had been monitoring the lion, which did not appear able to get out of the culvert. 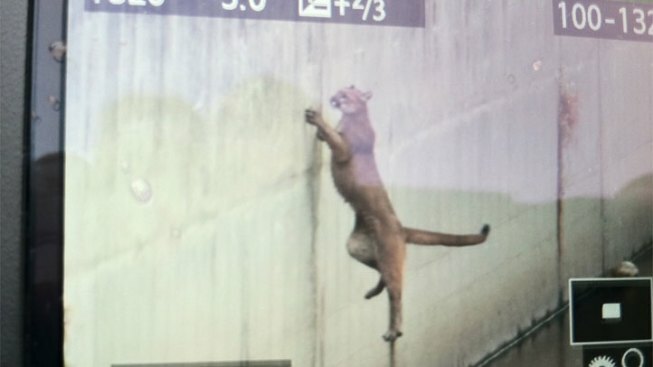 Three all-terrain vehicles had been lowered into the aqueduct as officers considered using them to guide the mountain lion to a place where it could escape. Check in with NBC Bay Area here for updates.